"Vegan dim sum restaurant offering vegan interpretations of classic Chinese dishes "
Not exactly the first place you think of for brunch, but there's something about having a savory Baked Veg Meat Bun or a Steamed Soup Dumpling in a bamboo container in the middle of Chinatown after a rough night that just feels so warm and satisfying. No alcohol here, but with all the food at such a cheap price you won't think twice about it. "Upscale restaurant serving seasonal plant-based dishes"
While not completely vegan, Jean Georges Vongerichten's newest concept, abcV, offers vegan versions of almost all the items in the menu. The restaurant itself is very vegetable-focused, with an emphasis on seasonal ingredients and a menu that is perfectly tuned to reflect that. The space definitely attracts a different crowd: one that feels more refined yet stuffy. Crowd aside, the food more than stands on its own. While the portions could stand to be a little more generous (pictured is what maybe one of the best Tofu Scrambles I've had served in the store's signature ceramic bowls), the ambience and service is quite great, which might be enough of a reason to come back. "Bicycle-themed bar serving classic, no-fuss dishes"
Located under the subway tracks in South Williamsburg, Bar Velo seems more like a discreet laid-back jazz bar than a restaurant, especially since the cocktails are great and they have live music performances playing during the week. Personally, the brunch menu could use some excitement, however, we give them points every time for taste and presentation. While the place is on the smaller side, the design of the space is very well thought-out. The decor fits perfectly with the bicycle theme: the walls are decorated with carefully curated vintage posters, the seemingly mechanically-cranked ceiling fan and the industrial hanging lightbulbs complete the look, and the horseshoe-shaped bar is front and center as you walk in, which is the whole point, because it is a bar after all. "Vegan crêperie specializing in teas and herbal remedies"
We would be remiss if we didn't include Little Choc Apothecary in this list. Located in probably the most small town-like street in Williamsburg, Little Choc is a hidden gem on Havemeyer Street. Besides offering both sweet and savory crêpes (pictured is the Breakfast Crêpe with Cashew Cheese), this place is called an apothecary for a reason. With over 100 different herb varieties, the restaurant offers specialized tea blends and herbal remedies for whatever ails you. Whether it be seasonal allergies or a hangover from the night before, their menu will probably have something to make you feel good as new. "Swanky vegan comfort food by Isa Chandra"
Known for her many cookbooks and beloved website Post Punk Kitchen, Isa Chandra's newest restaurant, Modern Love, has become a mainstay and popular go-to spot for vegans all-over. Specializing in vegan Southern-inspired comfort food classics like Seitan & Waffles and Shrooms & Grits, Modern Love also serves familiar brunch favorites like the Tofu Benedict Sandwich (pictured) and the Veggie Scramble with the Avocado Toast. As much as we love the food and the incredible service, brunch can be a little on the hit-or-miss side for us. However, between the rotating menu and the great cocktails, Modern Love should easily be on your shortlist for a great brunch. "Vegan kitchen and bakery focusing on wellness through food"
With a name like Peacefood, you can't help but think of some hippie granola bowl that vegan food is stereotypically associated with. This couldn't be further from the truth. With starters like the Chef's Potato Salad and the Pan-Seared Shanghai-Style Dumplings (one of our favorite go-to's) and brunch favorites like the French Toast Granola (pictured) and probably one of the best non-chicken "chicken" I've ever had, you'll start wondering why you haven't eaten this kind of food before in your life. We're fans of their newer Union Sq location, which is more open than their UWS location, but both are worth checking out, since they each have different specials that are exclusive to each location. 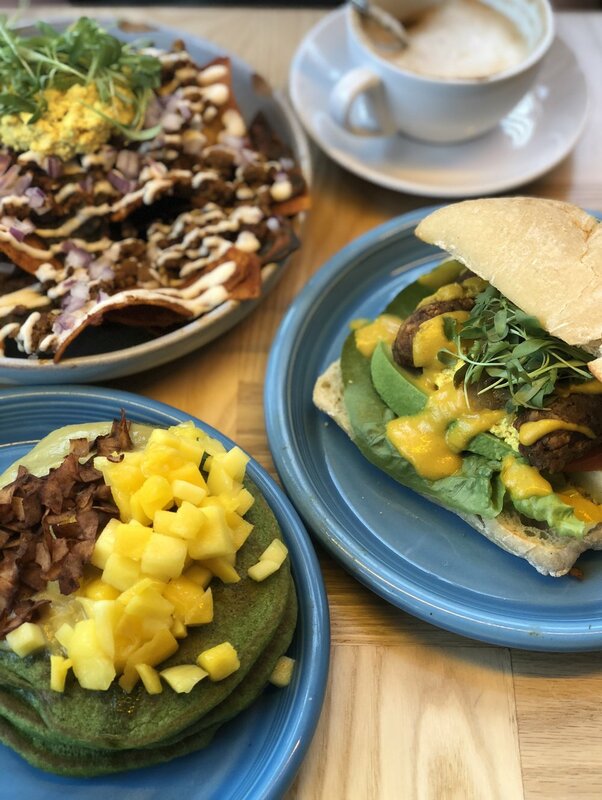 "Organic, vegan kosher cuisine using local ingredients"
With tons of gluten-, soy-, sugar- and nut-free plant-based options, in addition to being kosher certified, Sacred Chow is the place that has something for everyone. Tucked in an intimate spot in Greenwich Village, Sacred Chow is a humble restaurant that packs a punch where it matters: their food. Pictured is their Soy Buttermilk Biscuit Po'Boy with tofu scramble and smothered with their coconut white gravy. While it might take some time to get your food compared to other spots, Sacred Chow is known to make a lot of their food in house, like their handmade breads and coconut-cashew mozzarella. Rest assured, your food will be fresh and made to order. "Vegan crêperie and restaurant serving authentic French dishes"
French cuisine seems to be one of the least common cuisine available to vegans as we've learned over the years. So when we heard about a 100% vegan French restaurant right here in Manhattan, we were skeptical at first but nonetheless, excited to try. This family-owned restaurant has everything Julia Child herself would want to cook and eat: cheese plate (all cashew-based), foie gras, Tartine Club Sandwich with Bacon (pictured), scrambled eggs and beef steak (algae flour and 3 types of mushrooms, respectively), all of course if Mrs. Child decided to go on a plant-based diet. "All-vegan diner serving no-fuss Americana comfort food"
Almost everything in Champs' menu will make you question whether it's actually vegan or not: the Grilled Tofu is eggy, the soysage and the Blackbird Seitan are meaty, and the Spicy Chik'n sandwich tastes unmistakably just like chicken, which might freak some people out, but the goal of Champs is to bring you food that will make you feel like you stepped into just a regular diner serving food you know and love. All, of course, without having to question whether it's vegan or not. While not exactly the healthiest out of this list, Champs serves food that attracts everyone from the hungover hipsters, the out-of-town vegans, and the curious meat-eaters, making it one of the most popular brunch places in NYC. "Hip & trendy spot with a colorful Mexican-inspired menu"
Opened just last year, Jajaja (traditionally pronounced "Ha-ha-ha") has quickly built a reputation for serving flavorful and colorful modern Mexican fare in a fun, Instagrammable space in the LES. The only twist is, you guessed it, it's all vegan. With all-star hitters like the Shroomy and Eggs and Challah French Toast and unexpected favorites like the Kale Pancakes (pictured), along with their extensive menu of tequila and mezcal cocktails, Jajaja has all the makings for a great brunch. Be there early though, because the secret's out and this popular spot is known to attract the Sunday brunch crowd. "Vegan soul food to satisfy even the most skeptical carnivore"
Practically everything from this menu, which has influences from Middle Eastern, Asian, and Caribbean flavors, are so delicious that you'd want to take an extra order home (which is exactly what we did). Be sure to try the Chicken Parmesan Sandwich and the addicting Po'Boy Sandwich with an order of their fluffy and just-crispy Old Fashioned Pancakes (pictured) and their Baked Mac and Cheese. You won't regret it. Have you been to any of these restaurants before? Do you agree with our choices above? Did we miss anything that you thought needs to be on the list? Let us know in the comments section below!